I have a bumper crop of Thai sweet basil at the moment. Every summer I grow quite of lot of this favourite herb from cuttings. I bought a pack of basil, trimmed and put the stems in water, covered the leaves with perforated clear plastic bag and put in a cool light area. Change the water and clean the stems every few days to remove any decays. In about 10 - 14 days the cuttings would have long roots ready for planting. I used Thai sweet basil for Thai dishes as well as Chinese like three cups chicken. When I was in Thailand the last time, there was one unforgettable beef dish i really like but I just can't remember what it was called. It's a stir fried beef with Thai sweet basil and ground roasted rice. It's spicy, sweet, sour, salty and remarkably fragrant from sweet basil and ground rice. I have been trying to recreate it at home, the result been pretty good. Here is the guesstimate recipe, much as I can remember the taste, texture and flavour. Chargrill or fry the beef like a steak, medium rare. Leave to rest and cool. Then cut into thin slices. In a clean wok, heat the oil till almost smoking hot. Then drop in half the basil. The oil will sizzle rapidly. Stir and fry the leaves for about 1 minute till darker in colour and turning crisp. Remove and leave to one side. Remove most of the basil frying oil and leave about 1.5 tbsp. Heat and add in the garlic, stir till fragrant. Add chilli paste, sugar and fish sauce. Stir and reduce the sauce till quite thick. Quite easy just take a handful of glutinous rice (sticky rice) and dry roasted with a small frying pan. Keep the heat fairly high and keep stirring till rice grains turning rich golden brown. Leave to cool then ground using a coffee grinder or a mini blender till very fine like powder. You can sieve it if the grains look a bit coarse. Any leftover can keep in an airtight container for weeks. If you don't have glutinous rice, you can use jasmine rice but the rice grains can be harder, more difficult to grind and can feel gritty to the taste. This looks delicious. Thanks for sharing. Like you, I am buried with basil this year and looking for new things to try. Yes I changed the design last week. Gasp! You grow your own Thai basil! How marvellous - oh how I wish I had a garden. I grow this Thai basil in large tubs. Not on the ground, the snails will have them for breakfast lunch and dinner! Very easy you can grow them in a pot on the windowsill too. I tried seeds before did not work for me. Oh! 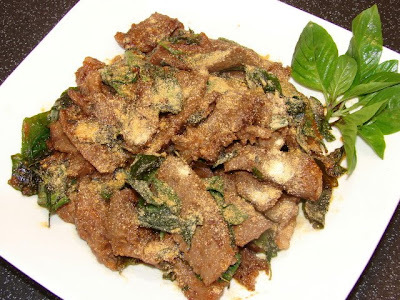 This beef dish looks so tasty...love the ingredient in it, specially the basil...YUMMIE!